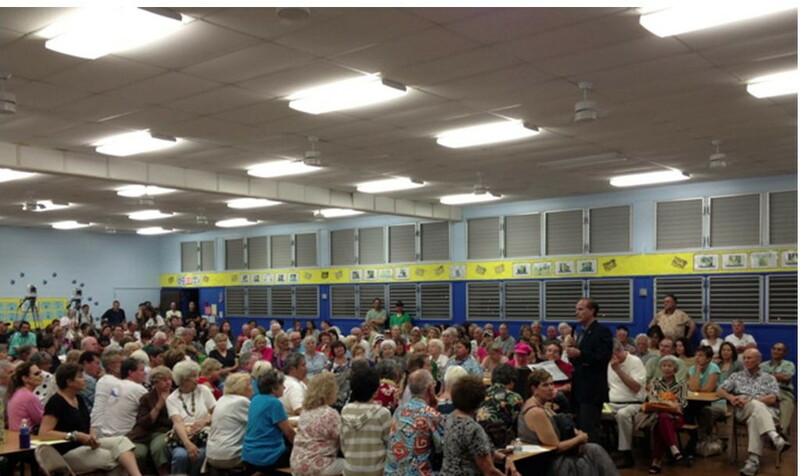 March 25, 2013 April 24, 2013 Hawaii House Minority Representative Gene Ward Ph.D.
BY MALIA ZIMMERMAN – Hundreds of East Oahu residents packed into Kamioliki School’s cafeteria Thursday night to hear more about a proposed commercial retail development on preservation land that the vast majority of attendees said they adamantly opposed. Kamehameha Schools wants to build a “gathering place” on 4.5 acres of land on the entrance to Hawaii Kai, which would include stores and restaurants and possibly an educational facility and bike and walking paths along the marina. The land, now zoned as preservation, is one of the few undeveloped parcels in the busy community, and it would have to be rezoned by the Honolulu City Council before development moves forward. There already are three major shopping centers in Hawaii Kai and a smaller one that is relatively unused at the entrance to Kalama Valley – all of the land under the centers is owned by Kamehameha Schools. Residents did not buy Todani’s attempt to downplay the development’s size or purpose, and were upset by several of her statements, especially as she compared Hawaii Kai to other “anti development” communities, as she claimed the development would benefit Hawaiian children at Kamehameha Schools, and as she used Hawaiian words that native Hawaiians attending took offense at. The meeting went further downhill for Kamehameha Schools and Foodland when they brought up their poll conducted by OmniTrak Group Inc. to gage support for the project. A representative from OmniTrak testified 72 percent of the nearly 400 people who were contactd were in support of the project, but several people in the audience said those results were highly suspect. Marian Grey, a resident who received a call from the polling company, said the pollster who she spoke to tried to convince her to support the retail project, even after she said several times that she was opposed and wanted the area to remain open preservation space. Rep. Gene Ward, the organizer of the town hall, announced he took his own poll with the results turning out much differently: 87 percent of residents oppose the strip mall’s construction on preservation land. Foodland Vice Chairman Roger Wall and two Kamehameha Schools representatives maintained the “Great Lawn” at the entrance to Hawaii Kai was the best location for the popular Foodland store to reestablish itself. Many residents hoped Foodland would return after it lost its lease to Walgreens and Petco in 2011, leaving just Safeway as the only remaining grocery store. “Following the Koko Marina store closure, we were asked by several community members to contact Kamehameha Schools because it owned parcels of land throughout Hawaii Kai that offered potential for us. The Kuapa site that we’ve really focused in on is the most viable. It’s central, it’s conveniently located close to the core of Hawaii Kai residents and to us, it’s the only site that makes sense,” Wall said. Ward co-sponsored the town hall with other area lawmakers including by Sen. Sam Slom, Sen. Laura Thielen, Rep. Mark Hashem, and City Council Member Stanley Chang as well as the Hawaii Kai Neighborhood Board. “Hawaii Kai loves Foodland, but we love the ‘Great Lawn’ more,” Ward said. Several residents spoke on their concerns about the project and how it would impact the popular dog park and Maunalua Bay, which is heavily used by paddlers, boaters, fishermen, picnickers, tour buses, firefighters in training and workout clubs. They also cited concerns about already heavy traffic fronting the Great Lawn property on Kalanianaole Highway. Others mentioned the view of the mountains that surround Hawaii Kai would be marred by development, and preservation land and open space is disappearing at too rapid a pace. “People know me as pro-business, pro-development, but you can’t do that at the expense of the last open space. This should be open, wild, nature space for all of us to enjoy because we have so little of it,” said Slom, who received loud applause from the audience. The Hawaii Kai Neighborhood Board, the organization that runs the Hawaii Kai dog park, many paddlers from Hui Nalu Canoe Club, and several other environmental and community groups have already come out in support of keeping the land zoned as preservation and free from commercial development. Neighborhood Board Chairman Greg Knuden said it is important for the land, which is the gateway to Hawaii Kai, to remain preservation. Resident Ann Marie Kirk also spoke passionately about keeping the land as preservation and said she had already written to the Kamehameha Schools President to ask if the land could be donated to the community so it could be a park for everyone in the area to use. Todani said Kamehameha Schools wants residents to be a part of the planning for the commercial center, leaving many residents feeling like she was implying it was a done deal, and all that had to be decided was what the mall would include. But after Thielen detailed the extensive permitting and rezoning process Kamehameha Schools still has to go through, Todani admitted it would take at least four years to get the project completed if it moved forward. Thielen suggested that many in the audience call their council member, Stanley Chang, to make sure they are informed if Kamehameha Schools tries to move the project ahead. According to a show of hands at the meeting, Foodland owners have the public’s support for a new store in an existing Hawaii Kai mall, but not for a new project on the Great Lawn. With nearly 400 people in the cafeteria that had standing-room only, just four people raised their hand in support of the project, and everyone else raised their hand in opposition. Realtor Rob Burns, who lives in Portlock not far from the land in dispute, is one of the residents strongly in support of the project. He asked his neighbors to keep an open mind. But Burns was vastly outnumbered and his comments were met with groans. “I’m not trying to win a popularity contest,” Burns said. The audience “booed” Council Member Stanley Chang after he first said he would listen to the people of Hawaii Kai who made their feelings opposing the project clear, but then qualified his statement moments later saying he had not decided whether he would support the project. Several people after the meeting said they were disappointed by Chang’s “wishy-washy” behavior and would not support him in the council next election.